Images here are from John O’Connor at Nasatech.net, and enjoy a close-up video of the launch, below, from Matthew Travis. A standard video view of the launch is below. 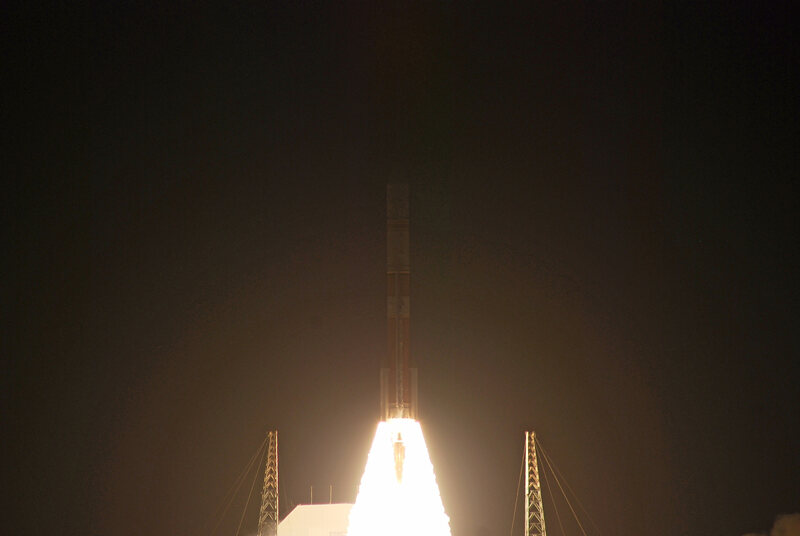 On board was the WGS-6 (Wideband Global Satcom)a big 6,000 kg (13,200 lb) satellite that is part of a military communications network shared by the United States, Australia, Canada, Denmark, Luxembourg, the Netherlands and New Zealand. Clear of the lightning towers the WGS-6 mission streaks to super-sync geo orbit. Credit: John O’Connor/nasatech.net. Greetings from east of the Atlantic Ocean. I am puzzled. What is Starship Asterix about? The pictures on APOD are NOT secret. Could we not have a simple comment box to praise or otherwise, the enormity of these pictures? If APOD is secret, what the hell is it doing on the Internet. I was looking for a simple comment box. It would be nice to be able to bookmark certain dates to look them up later. APOD is not clever. Astronomy is not clever. It is simply photographs of OUR Universe taken by Hubble and other telescopes. Don’t you want us earth bound peasants to see them. I am 70 years old. In 1968 I was 26. I worked in Britain’s then Aviation Industry. We made Avro Vulcan bombers. We had access to Aviation Week and Space Technology magazine. I was at school when Commander Shepard flew the first Sub orbital flight. I followed the Gemini program in the 60’s and listened on the radio in Ireland as Apollo 8 went 10 times around the moon at Christmas 1968. Call me a Paddy if you wish. It is better than being a nana. I have followed it all ever since. Apollo 13 was a big worry. Apollos 15, 16 and 17 were the best and get no credit whatsoever. I have a picture of Commander Shepard’s first golf ball, on Apollo 14, before the 2nd went ” miles and miles and miles “. No one will ever find that one. The Space Shuttle which is no more was magic. Unless there is a hidden agenda. This is the only page I can find to make any kind of observation. Please pass it on to anyone who might be interested. Apod is only 18 years old. It is still a teenager. Unless of course you are not interested in sharing it with ordinary people. It would be nice to see a comment box such as others have. Or is that asking too much. Do astronomers agree. Is there 2 people on the planet who can agree what day it is.? Britain, this United Kingdom, can be forgiven, especially Northern Ireland, because all our young folk want to do is throw stones at policemen. We live on such a beautiful planet, the only one we know of to date with life on it, and one day we’re going to wreck it. I worry about it sometimes, then I think, sod it, have another drink and fall asleep. No more worries. For sure if disaster happens, it will not come from ordinary people. Just watched the Delta launch. Not seen many of those. That is the hard part, getting off the ground. It ‘s easy after that. John Glenn launched , I think in 1963. That was before Cassius Clay beat Sonny Liston . We were working overtime that evening , and all the old boys reckoned Clay would get hammered. Old folk are so stupid. Cassius Clay “floated like a butterfly and stung like a bee” as he “whupped” the then World Champion. Eeh ba gum.! The sixties were heady times. You have all got a long way to go. Does any one know why China is taking so long to follow. They have all the bits for earth orbit, but at some point they have to break the surly bonds and push on out. It will still take 3 days and then they have to get down , back up again and then home again. I hope they share some of it with us. It seems to me that is the easy bit for anywhere else is so far away. It will be the aircraft industry who does it since they have the capability to do it. Good luck to them all. Who ever goes, they will be brave people. Me. Previous PostPrevious Why Do Stars Twinkle?